Successful aquarium algae control is achieved by controlling nitrate levels, as well as limiting light exposure to the tank. For growth, aquarium algae depend on oxygen, light, water and nutrients (primarily nitrate). 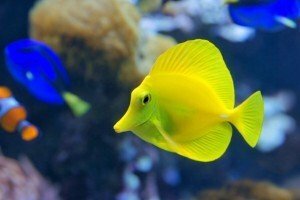 For obvious reasons water and oxygen can’t be eliminated from the aquarium. Therefore, controlling light and nitrates are our best algae control options. Nitrate is a natural part of the aquarium nitrogen cycle, therefore we can not simply aim to eliminate it entirely. Nitrate is a by-product of decaying waste in the water. Its production is constant. The primary pollutant in most aquariums is fish food. This can be in the form of uneaten food settling in the gravel, as well as digested food in the form of fish excrement. Both result in nitrate from the conversion of waste, facilitated by naturally occurring nitrifying bacteria. Feed sparingly – only once a day. Fish have a very slow metabolism and don’t require 3 meals a day. In the absence of food, fish will graze on algae and food particles settled on the substrate. Do not overstock the aquarium. Too many fish in too little space results in increased waste. Increased waste results in increased nitrate, creating favorable conditions for algae outbreaks. 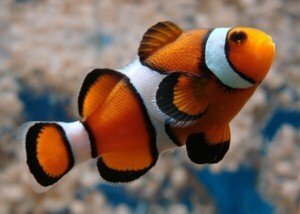 Our general aquarium stocking recommendation is approximately 1 inch of fish per 2 gallons of water. 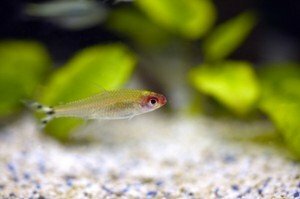 Consider mature size when adding new fish to the aquarium. 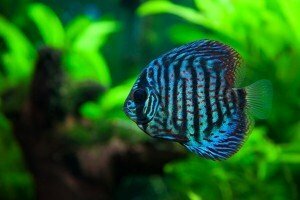 Use an aquarium nitrate remover such as ALGONE to maintain low nitrate levels in between water changes. Change 10 – 15% of the aquarium water every 10 – 15 days. You will be able to change water less frequently if you follow above steps 1 – 3. Carbon, CO2, minerals, and phosphates, should also be managed in addition to nitrates. They also have an effect on potential algae outbreaks. Algae are photosynthetic and therefore require light to produce energy (sugar) for food. 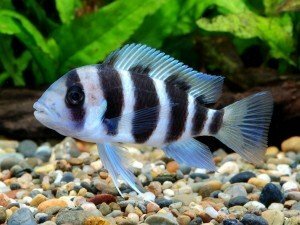 Set up your aquarium in a location that receives no direct sun light. If the aquarium is setup in a location that receives direct sunlight lower a blind when needed. Limit the daily lighting duration (aquarium lights) to 6-8 hours, depending on the amount of natural light the room provides. This can be shortened considerably when dealing with existing green aquarium water or an algae bloom. Replace light bulbs every 6 – 9 months. The color spectrum changes in aging bulbs, as a result the light becomes more favorable for algae growth. 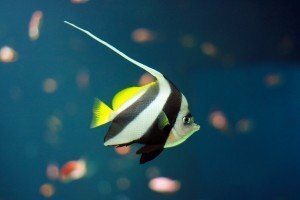 Avoid high intensity aquarium lights, unless required for a planted aquarium or reef tank. Most natural freshwater habitats aren’t brightly lit, so most aquarium lighting is provided for the benefit of people, rather then fish. With the exception of planted and reef aquariums, we recommend lighting for as little as 4 hours a day. Turn on the lights when you spend most time around the aquarium. Limit aquarium lighting period. Avoid direct sunlight.